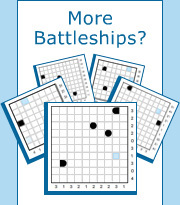 Battleships puzzles can be played interactively on the computer, offering many features and advantages compared to pencil and paper. This section explains everything about how to play Battleships on the computer. If you are not yet familiar with the puzzle rules, please go to Battleships rules. Battleships interactive is played by filling squares with ship segments or water. First click fills the square with water, second click fills the square with a ship segment and the third click brings the square back to its original state. Multiple squares may be filled or blanked by dragging the mouse. When filling a square with a ship segment, the square will turn gray indicating it isn’t yet known which part of the ship it is going to be. As gray ship segments become surrounded with water or with other ship segments the color of the gray squares will change to black and their shape will change to show the appropriate ship segment which they represent. When all squares in a row or a column are completed, the corresponding number will change to gray. Empty squares in a row or a column may be filled with water by clicking the corresponding number. To finish the game, all squares must be filled with either ship segments or water. When the last square of the puzzle is filled correctly, a congratulations message will pop up. Show ship conflicts: Check this box to automatically show conflicting ship segments during the game. Show ship errors: Check this box to automatically show wrong ship segments during the game. Auto complete row/column: Check this box to automatically fill with water empty squares in a row or a column when the number of ship segments is correct. Auto surround with water: Check this box to automatically fill with water according to the rules empty squares surrounding a ship segment. Open How to play Battleships page you are reading now. Show fleet: Check this box to show fleet under the puzzle. Show water as X: Check this box to show water segments as X.